ST. 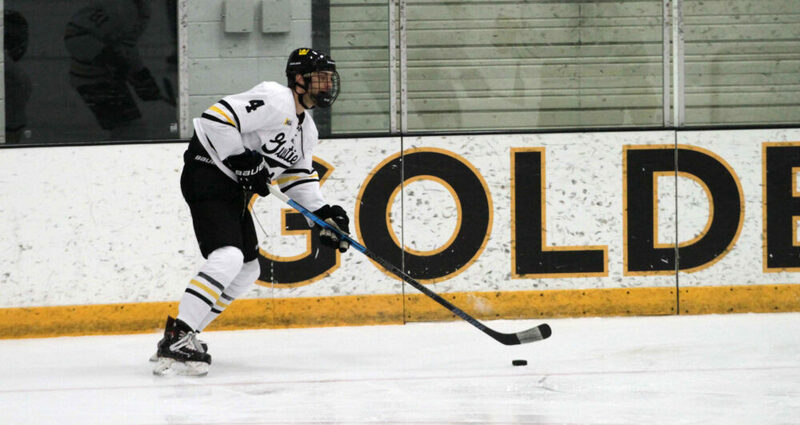 CLOUD, Minn. – The Gustavus men’s hockey team Thursday lost 2-0 against Saint John’s, falling to 7-16-1 overall and 4-10-1 in the MIAC. The Gusties are now eliminated from playoff contention. The Johnnies scored what proved to be the game-winner 10:17 into the first period and held a 1-0 lead until late in the third when Gustavus pulled goalie Robbie Goor (So., Anoka, Minn.) for an extra attacker. Saint John’s took advantage with an empty-netter with 48 seconds left in the game. Goor finished with 24 saves in his third consecutive one-goal game. The Gusties outshot the Johnnies 44-26. The two teams wrap up the series at 7:05 p.m. Saturday at Don Roberts Ice Rink where the Gustavus seniors will be honored.